Millenium Sport Cordygen NanO2 ELITE is the highest-quality pre-workout supplement, containing only natural active substances, the origin and quality of which were confirmed by the American ecological sign USDA Organic. This product combines two active formulas, Oxy-Ceps NanO2 and ActiGin, the synergistic activity of which causes increasing efficiency, endurance and energy during the most exhausting workouts. Carefully selected ingredients, thanks to applying the technology of nanoparticles take smaller space, due to which they may be higher concentrated and demonstrate even stronger effect. Moreover, nanoparticles are easier absorbed and start to work faster. The product contains as many as 60 portions, in the form of easy to swallow vegetarian capsules type V-CAPS, which ensure easier release of active substances and their accelerated activity. In the composition of the formulas Oxy-Ceps NanO2 and ActiGin there is a range of plant extracts and substances gentle for mucous membrane of the digestive tract and the whole product does not contains artificial additives, gluten and GMO. Oxy-Ceps NanO2 contains the extract from cordyceps (Cordyceps sinensis), which provides numerous, valuable active substances, such as hydroxyethyladenosine, cordycepic acid and adenine. Their activity is focused on increasing muscle energy by the supply of essential substrates used for the synthesis of energy compounds and nucleic acids, without which the process of protein biosynthesis and the development of the muscle system would be impossible. Chinese cordyceps extract (Cordyceps sinensis) is a natural extract from the type of mushroom, known for centuries in Chinese medicine, demonstrating multidirectional, positive influence on the human organism. It commonly appears in the regions of Tibet, where it is used by local people as a drug to treat numerous ailments. Its anti-inflammatory and anti-rheumatic activity was noticed as well as the influence on widening blood vessels and slowing down aging processes. The itnake of this fungus improves concentration and adds vigor. In many parts of the World, it is also called “Himalayan Viagra”, due to its positive influence on potency. Adenosine is a biologically active organic compound from the group of nucleosides, constituting the combination of adenine with ribose. It is the component of the most important substances for cells, such as ATP or nucleic acids, therefore its activity is multifactorial. It takes part in the transport of energy, due to which it enables its utilization for the reaction of synthesis and also its extraction from catabolic processes. Adenosine is also the component of DNA and RNA, which are responsible for constant transmission of genetic information, gene expression, DNA replication and due to this cell division, the growth and development of the whole organism. Moreover, this compound conditions proper activity of the nervous and hormonal system, as it constitutes an important neurotransmitter and element of cellular transduction of signal, thanks to which it is possible to stimulate fatty tissue to lipolysis and obtaining even higher energy amount for muscle work. Hydroxyethyladenosine is a purine derivative of adenosine, which additionally regulates the transport of calcium ions through calcium channels present in cell membranes. Calcium cations play a role in nerve transmission, but more importantly, they are essential for the contraction of smooth and skeletal muscles. Thanks to hydroxyethyladenosine, partial reduction of smooth muscle contraction being the component of blood vessels is possible, which leads to the increased amount of oxygen and glucose, essential for work of skeletal muscles. This effect promotes higher efficiency and endurance during workout and also increased ATP synthesis. Adenine is one of five nitrogen bases which are the components of nucleic acids and also adenosine precursor and its derivatives. It also builds important carriers of protons and electrons NAD and FAD, important from the point of view of energy extraction by means of cellular respiration. Increased adenine supply and its derivatives may increase the efficiency of energy production, which is a desired effect for each sportsman. ActiGin is a natural formula containing in one dose 50 mg of extract from the root of anax notoginseng and the fruit of Rosa roxburghii. Its task is to increase endurance, especially during intensive workouts and thanks to its antioxidant properties it may reduce unbeneficial influence of free radicals produced as a result of oxidative stress, which allows mitochondria to adapt to increased physical activity. The effectiveness of activity of ActiGin is confirmed by independent clinical studies. They indicate i.a. increased regeneration of muscles by 373% in the third hour after exhausting workout thanks to accelerating the pace of glycogen synthesis. The decrease of post-workout damages of muscles and improvement of their endurance by 20% was noted during work at the highest level of intensity. Moreover, extracts from Panax notoginseng and Rosa roxburghii have many pro-health properties. They improve cognitive functions and well-being, increase motivation and add energy for a long time. The most recent scientific reports also mention about the influence on the improvement of life quality of people with dementia and potential anticancer activity. 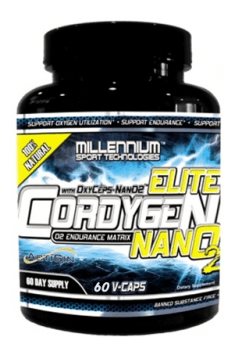 To sum up, Millenium Sport Cordygen NanO2 ELITE is a complex combination of natural ingredients supporting strength, the organism’s efficiency and the synthesis of energy compounds. Plant origin of active substances makes the preparation safe to use, while the utilization of nanoparticle technology and their application in the form of easily assimilable capsules guarantees immediate effect, which may turn out to be a valuable benefit for people who want to quickly start workout. Cordygen Nano2 Elite 60 caps. Assess your tolerance and needs one capsule at a time. For best results take two (2) capsules sixty (60) minutes pre-workout, prior to endurance event or cardiovascular activity. Reduce dosage when taking with other cordyceps containing products. Smaller athletes may use a reduced dosage. Do not exceed four (4) capsules in 24 hours. People who start supplementation with this product are recommended to take one capsule at a time and observe the organism’s reactions, as a smaller dose may be sufficient for beginner sportsmen. More advanced users may take the supplement according to the recommendations, however, do not exceed the amount of four capsules a day. It is also recommended to decrease the dose if you use other preparations containing cordyceps extracts. The supplement may be used in combination with agmatine, creatine or BCAA. It is not recommended to pregnant women, breastfeeding mothers or people with serious health problems before the consultation with a specialist. The producer of the highest-quality supplements for sportsmen. The company focuses on the most advanced preparations designed on the basis of the sportsmen’s experience and scientific background. Millennium Sport Technologies supplements are produced with the highest care of the pureness of their composition, which not only guarantees their effectiveness, but also ensures safety of use. Vegetable capsule (cellulose and water), microcrystalline cellulose (vegetable source), magnesium stearate (vegetable source), silica. Dietary supplement with amino acids and caffeine. It increases the energty levels and improves regeneration.